Sometimes when a season is pretty anemic you just need something to be good. For me that’s exactly what Harukana Receive proved to be. 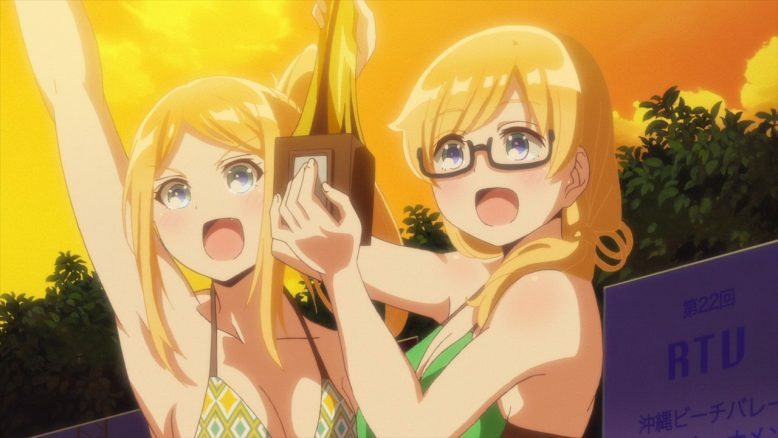 A very solid and good show that provided enough entertainment during the Summer 2018 season. That’s not to say this isn’t a good and enjoyable series. I had quite a bit of fun with the first few episodes in seeing the first impressions made by Kanata and Haruka as the leads. The good, but not necessarily great category is still pretty handy to have. This is a show that is bright, fun, and all about beach volleyball. And this is very much a sports series. The drama that various characters have is ones you might expect from a sports show. 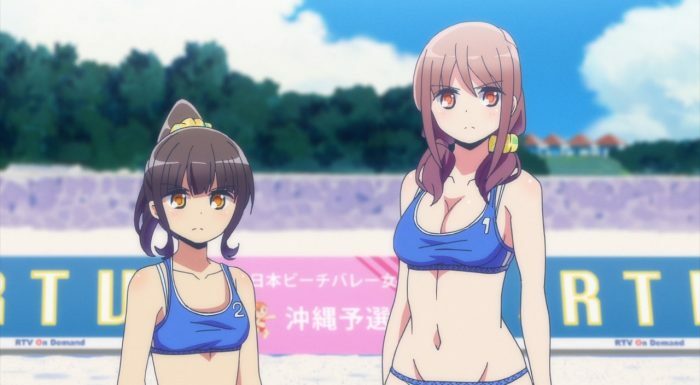 And while the show doesn’t shy away from the fact that various characters spend most of the time in swimsuits, it is about sport and competition. The story is set in Okinawa and the premise is pretty straight forward. Haruka is moving out to Okinawa to live with her cousin Kanata. 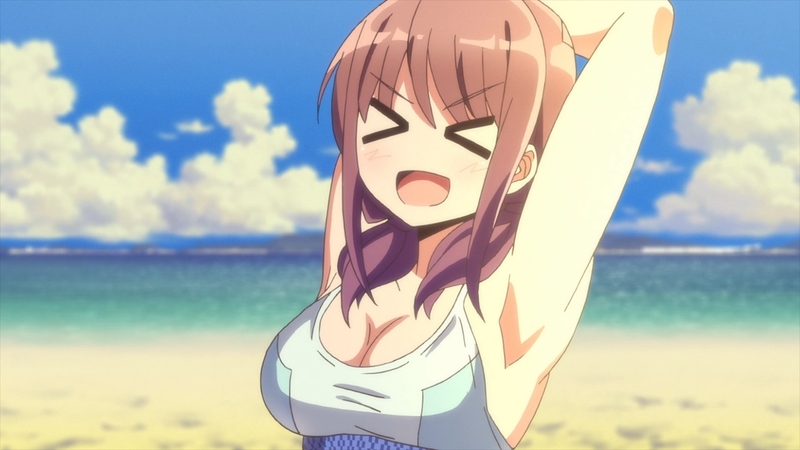 From that point forward she gets involved with beach volleyball and eventually teams up with Kanata as a pair. Beyond that there is drama/story around Kanata’s past with beach volleyball. The pair meet up with various people involved with beach volleyball and grow as young athletes. In a sense the story doesn’t get too much more complicated than that. A lot of focus is spent on Kanata’s past and deepening the connections with them. As a sports series the show has plenty of time spent on matches as you’d expect. I will say they don’t rush too fast to the official matches since Haruka comes into this show needing to learn the sport first. 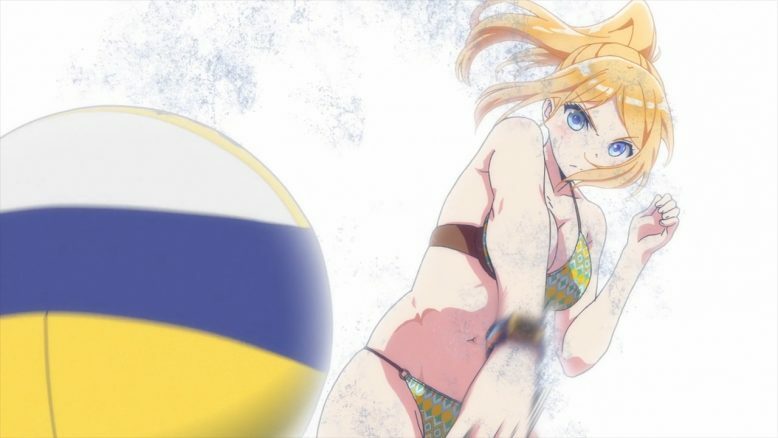 But the show is all about the beach volleyball and most of the episodes take place on some sort of beach. Being school students there are some scenes in a school, but you won’t see them in a classroom much. 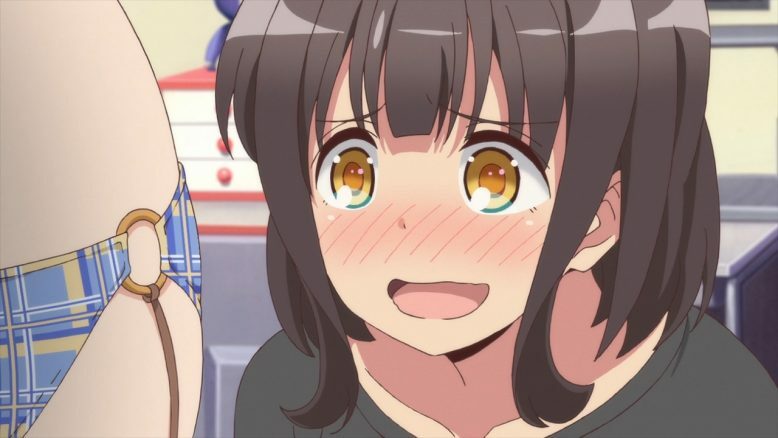 In a sense it’s kind of like Baby Steps where main character is a student, but that’s not where the focus is for the show. The show is pretty straight forward with a lot of training, matches, and some time skip between tournaments. There is plenty of what you would expect with flashbacks/story sequences for rival pairs and delving into Kanata’s past more as the show unfolds. The cast for this show is rather small. You have the two main characters in Oozora Haruka and Higa Kanata. Along with them you have the major rivals in Narumi and Ayasa, along with friends/rivals of the Thomas sisters Claire and Emily. There are some other minor characters like Kanata/Haruka’s grandmother and Akari who joins the show midway through. But the main focus is really on the main pair and honestly even more so Kanata than Haruka. In a sense Haruka is the wind of change that pushes the story forward. She is an important catalyst, but a lot of the drama and character growth is saved for Kanata. The show focuses rather clearly on Kanata’s past. In terms of the person who connects to the various rivals and directs the path of the story it is Kanata. Haruka being the outsider doesn’t have the same connections to these characters. In a weird sense I think the story did have things set up for Haruka, but there just wasn’t time to dwell on her too much. 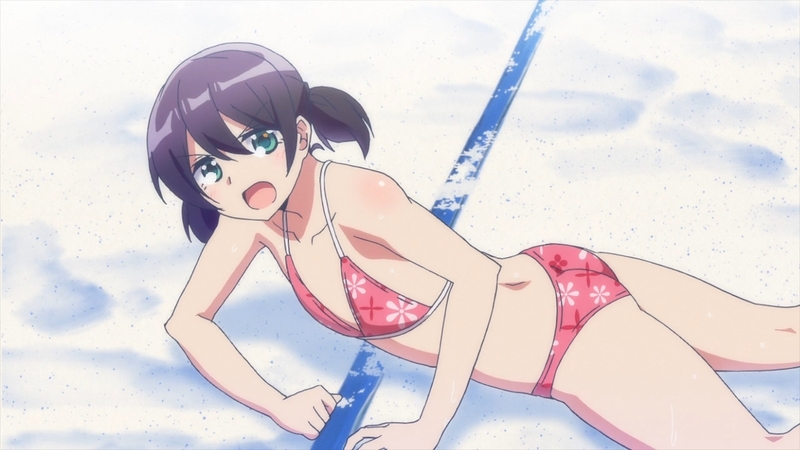 The show at its core is a sports story so Haruka’s development as a beach volleyball player was more important than her character developing too significantly. She comes into the show as this big bundle of energy that is critical to helping Kanata with her issues and pushing her forward. Without Haruka the show just can’t happen. The show just happens to revolve quite a bit around Kanata. Her past with the sport and growth as a character needs to happen for the story to progress. I do like that they take time throughout the show to delve more and more into her past. A lot of it comes in the first few episodes. You still get an idea of what kind of person she used to be and her role in shaping the lives of various rival players. The rest of the cast is pretty good. Early episodes honestly made me really like Narumi’s character and want to see more of her. The downside for the show is that she’s a major part of Kanata’s past and an important rival…but she’s so far ahead that she doesn’t get to say around the main cast very long. Ayasa is likable enough as her partner, but she’s just not a major figure. The most important additions behind Haruka/Kanata is Emily and Claire. 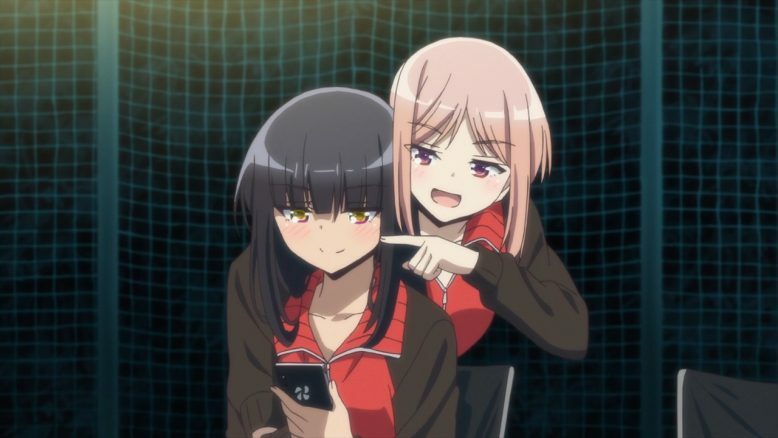 These two are rather skilled players with a past connection with Kanata. And they are rather important to helping Haruka grow as a player. Both Emily and Claire are pretty likable individuals who bring plenty of energy to the show. They get background information sprinkled throughout the season with more of it coming near the end of the show. 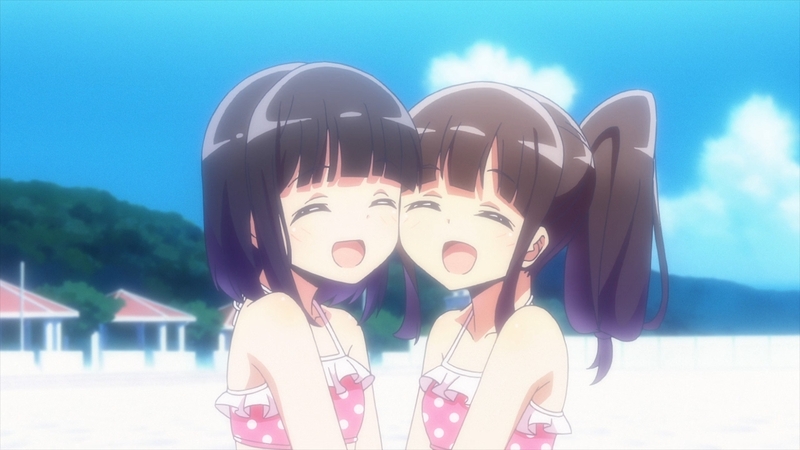 Both Emily and Claire despite being twins do have their own defined personalities and different ways they support Haruka and Kanata. Honestly the show looked pretty good. I think what stood out for this show was the sand effects. That might sound odd, but really there is a lot of diving into sand in this show. It does feel like there is a match being played with so much disruption of the sand. The characters themselves look pretty good. Haruka in particular has some entertaining facial expressions. Everything in the show is very bright and fitting the overall upbeat tone of the series. Of course there are plenty of characters in swimsuits, but that’s kind of a given considering the sport. They do seem to put in the effort to make it feel like a sport is being played with the sand effects and the characters sweating harder as the matches go on. I’d say the music for the show was pretty good. The OP/ED combo was solid. I was impressed as well that they cut the ED a few times in the early going in order to fit in more story. The voice acting was perfectly fine and I liked the main cast quite a bit. The music wasn’t a huge stand out, but it seemed to fit the show and added to the more intense matches. As a whole I stick to the idea that this show is good, but not spectacular. It is a pretty standard sports series. I think it starts out strong and has some good emotional moments in the first couple of episodes. The downside for me is that after those first few episodes the show settled into a good, but not overly impactful sports show. There was a taste of what the show could have been. Perhaps the show simply didn’t have time for too many big emotional moments when it had to fit in a certain amount of matches and getting the story to a certain point before the end. This is also the adaptation of an ongoing story. So it is possible various character moments are set to come later in the story than the anime could deal with. All that being said, the show is still very enjoyable. The main cast are fun, energetic, and love their sport. They do take time (and use time skips) to allow the main characters to improve at a rate that is believable. And the show proved to a nice window into a sport that I personally don’t follow. It was fun enough to catch my attention in the early going and held up well enough that I enjoyed it until the end. The show is a very solid B for me. It doesn’t risk being one of the best shows of the year, but a good show to enjoy when you have the free time to watch it.